Good. Finally my tax dollars are being put to good use. No big deal, nothing to see here. :\ What is that they're driving on? Mud? LOL at the 32 inch TV stuck in there haphazardly. In Arizona, drive south on I-19 between Tucson and Nogales and you'll see this all day, every day. It's really bad on weekends, when Mexicans hit up all the yards sales in southern Arizona. The Highway Patrol doesn't even give them a second look. ...because all that stuff was tied to a car instead of a motorcycle. One of my husband's uncles managed to lose a mattress on the Dan Ryan that way when he was trying to do a move in Chicagoland on the cheap. I saw a dresser and all it's contents smashed to kindling and scattered along about 1/4 mile of interstate just last week. It's a major hazard when people dump stuff like this. I ran over a mattress once myself. Did the cops have the van impounded or at least make the driver unload it? Or did they do nothing more than give him a ticket and let him go on his way? All that stuff could easily kill somebody on the road when it tips over. I've been to one of those countries, and seen everything. Individuals strap-hanging the rear of a Filipino jeepney at 55-60 on the Marcos Highway after dark - you name it! lol And it's all in a day to those folks. I've seen empty liquid fertilizer containers fly out of pickup trucks beds on US 19 in Clearwater Florida, almost hit the car following the truck witch was traveling above 70 mph. People do not think and could care less about other drivers. CONCORD, N.H. (AP) — One New Hampshire driver should've heeded the old advice that you can't take it with you. 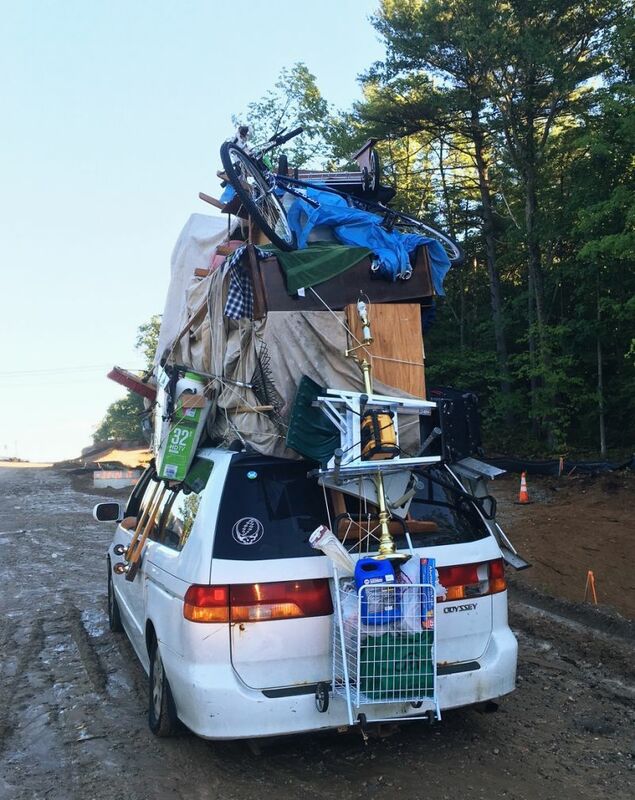 WMUR-TV reports a minivan pulled over on Wednesday had furniture, bicycles and boxes strapped to the roof and a wheeled basket dangling over the back window. There was also a furniture dolly hanging against a driver's side window. What do you mean in the Philippines the USA is looking like a 3rd world nation everyday. When I lived in Florida it felt like I was i Cuba or Mexico look at Chicago more Spanish speaking people their than English speaking, same with Clearwater Florida. Hell I could never understand what my neighbors were talking about it was all in Spanish. So if anything happebd to me or my wife and wanted a neighbor to call 911 I was screwed.